Teachers rule! Last week saw the presentation of the Lasco/Ministry of Education 2013-14 Principal and Teacher of the Year awards during a well-attended ceremony at the Pegasus Hotel in New Kingston. 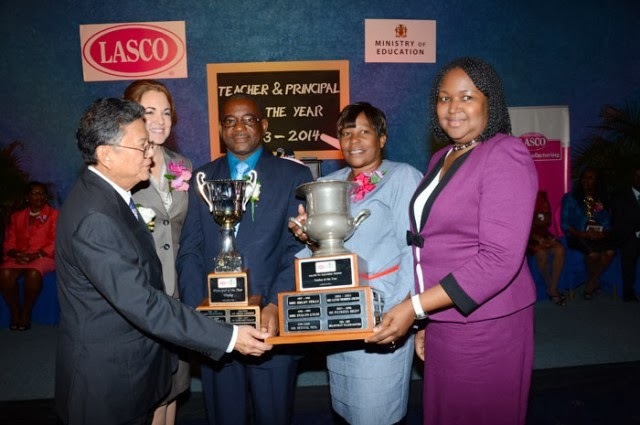 While the principal's award went to Norman Malcolm, headmaster of the Windward Road Primary and Junior High, Janet Walters (St. James' John Rollins Success Primary) was announced as this year's most outstanding teacher. Kudos. The diplomatic community, meantime, has warmly welcomed China's newest man in Jamaica, Ambassador Dong Xiaojun, who was feted along with members of his family and staff at the Pegasus' Talk of the Town recently. Custos Marigold Harding, Thalia Lyn and Dr. Peter Phillips were among those in attendance. And proving anew that even the best-laid plans are subject to sudden change, organizers of the Jamaican Epicurean Escape (the hardworking Marcia McDonnough and co.) have announced that the event, originally scheduled for Saturday, November 30 and Sunday, December 1 in St. Ann, has been rescheduled for next May's Labour Day weekend. Last year's event featured an appearance by music icon and cookbook author Patti LaBelle (at right). And on a mournful note, heartfelt condolences go out to former national football coach Theodore 'Tappa' Whitmore and family, who are currently grappling with the death of Whitmore's son Jhouvaine, who was hit from his bicycle while riding along the Retirement Road in St. James last week. Jhouvaine, 14, was a student of the Montego Bay-based Cornwall College.